Albert Einstein was one of the greatest thinkers of all time. He was also a philosopher and a scholar and a man who refused to acknowledge the existence of the word “impossible”. He triumphed over many setbacks by walking away from a failure then looking at it from a different perspective. Using the same materials he reconstructed his failure in a different way to make it a triumph. The words of Einstein are seen as inspirational and this is certainly the case with our Listen to Einstein business ecards. 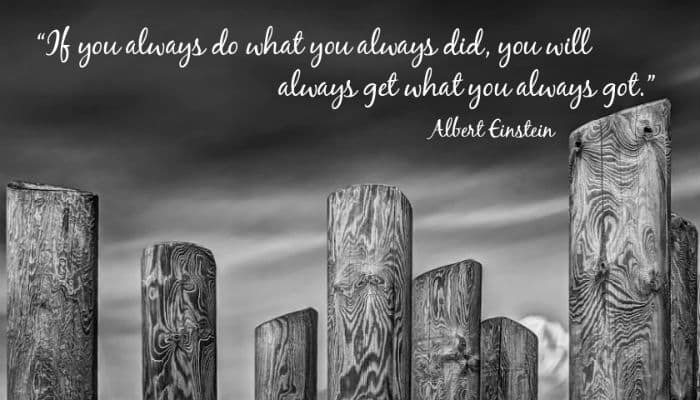 Against a striking image of planks of wood with a dark, brooding sky behind them is this quote from the great man himself; “If you always do what you always did, you will always get what you always got”. Success is about learning from your mistakes, if only everyone thought this way. So many people, particularly in the workplace, believe because they have failed once they always will, and this isn't the case. If somebody you work with didn't get that promotion, for example, send them these ecards instead of empty words. They don't want condolences, they want encouragement, and that is what these ecards deliver in the most eloquent of ways. Speaking of eloquence and class those are just 2 words to summarise our amazing corporate Christmas ecards that will give your company Christmas marketing a genuine wow factor.